Gloucester bed and breakfast travel guide for romantic, historic and adventure b&b's. Browse through the iLoveInns.com database of Gloucester, Virginia bed and breakfasts and country inns to find detailed listings that include room rates, special deals and area activities. You can click on the 'check rates and availability' button to contact the innkeeper. Gloucester, Virginia offers the Air and Space Museum, Chrysler Museum, Mariner Museum, and Waterman's Museum. The shopping areas in the vicinity are MacArthur Center Mall-Norfolk, Patrick Henry Mall-Newport, and the Prime Outlets of Williamsburg. From Gloucester bed and breakfast inns, guests can go boating with kayaks and canoes rented from Bay Water Excursions and Mobjack Sailing. 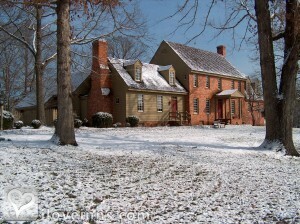 Gloucester happens to be situated in a historical area featuring Williamsburg, Fairfield Plantation, Jamestown Settlement, Rosewell Stratford Hall, and Yorktown Battlefields and Victory Center. Other interesting locations near Gloucester are Abingdon Episcopal Church, Christchurch School, Virginia Institute of Marine Science, Williamsburg Winery, Virginia Coastal Birding Trail, Ware Episcopal Church, Busch Gardens, and Matthews Loop. By Inn At Warner Hall.